Villa Camomilla sits on a family estate of over a thousand acres that has been in the family for generations. No matter where you are your views are unobstructed and varied, from pristine forests, immense olive groves, and out over spacious valleys , lakes and rivers. 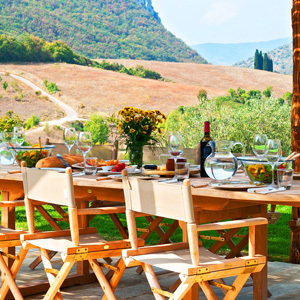 It is the perfect place for a relaxing, tranquil villa vacation, blending the beauty of the Umbrian countryside with the sophistication of a five star hotel. Your concierge is available during your entire stay, to offer you anything from directions, restaurant bookings and last minute tours and excursions. Your garden has been planted with more than 3,000 plants, the master gardener making sure that there is always a display of colors from spring through autumn. Care has also been taken so that the scent of flowers mingle in harmony in the garden as well.